Quaint and Quirky: Cute Pockets and Great Girly fun! 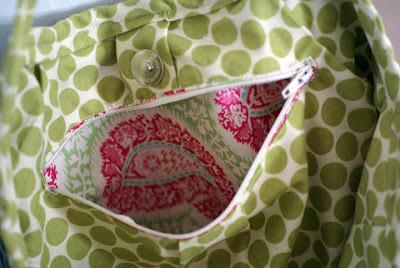 Cute Pockets and Great Girly fun! The camera finally cooperated. It hasn't felt like doing USB transfer lately. I think it's bored with USB transfer. Here are the bags I've made lately. 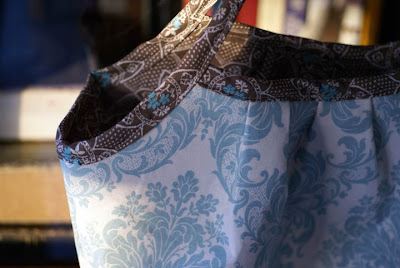 I found a design I liked, then I found a tutorial on the Internet at Belle Epoque Whimsy. I was able to fulfill my own fabric buying desires while making presents at the same time! 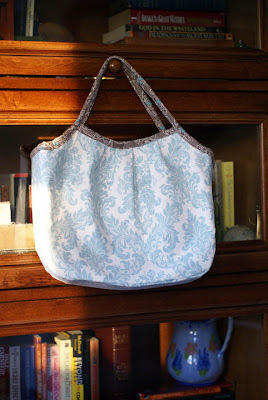 The first is my mother-in-law's bag made with Anna Griffin fabric: Cute pocket - I'm into cute pockets and other special details right now. I didn't get a picture of my mom's bag, but it's the same design, with orange, turquoise, and brown Amy Butler fabric with a striped interior and polka dot trim. Then I needed one too, of course! 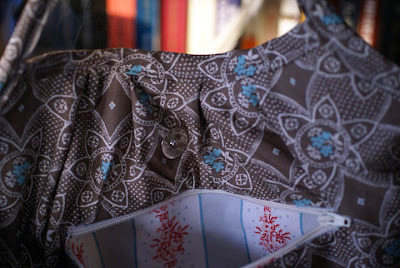 I did buy my own fabric at the same time, but I used money gained by selling some Red Sox tickets that we couldn't use, so I was still within the spending rules (in my mind anyway, and since the punishment is self-inflicted, it's all good!) . The fabric for my bag is Amy Butler throughout. I chose the bags because the theme of our church's Mother's Day luncheon was purses. 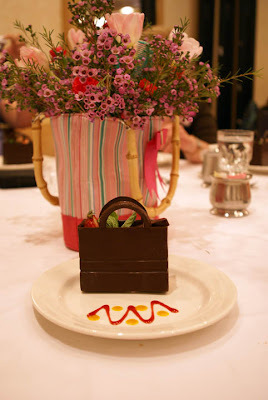 It was a cute event, from a purse runway show to purse shaped desserts! Great Girly Fun! I love the prints of the fabric you used, really cute! I went on a yarn fast for the month of May. It was torture, but I got to get new curtains for my dining room. Joann's is indeed evil! That is such a nice pattern for a purse! All the fabrics you used are excellent choices! I love the fabrics! Great choices. 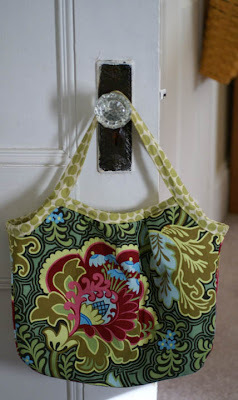 How do the handles hold up on the bag? Do you find the bias tape to be sturdy enough? Oh those purses are fantastic! I really love yours...and those chocolate purses must have been so much fun! Keri, I tagged you on my blog!